We devoted our most recent newsletter to this issue of fear in general, but more specifically travel fears. (If you’re not subscribing to our newsletter, you can do so here). We’ve both worked in public relations and know how to sell a good story. And fear is one of the best ways to sell. But a life lived in fear really isn’t a life at all. This made us question our own fears. We’ve also had to confront those things inside us. My fear has evolved gradually. It didn’t used to be this way. There isn’t some horrible incident I can point to. But somehow, over the years, I’ve developed an increasing fear of heights. 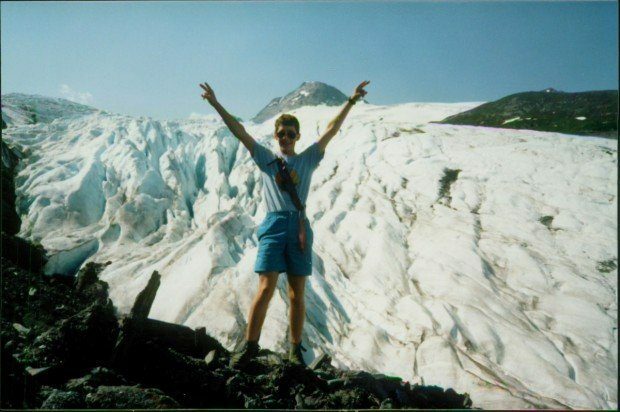 For a travel blogger who loves to explore the world, it has caused some serious difficulties. I grew up in the mountains of Colorado. My grandfather and father were rock climbers – scaling cliffs and mountains for sport. When I was very young, I was fearless and took the up the family hobby. There’s nothing that happened to cause this. I never fell. But here it is – I’m afraid of heights. It comes upon me at weird times. The first time I remember it was walking along the city walls of Ronda, Spain and looking down into the deep gorge. 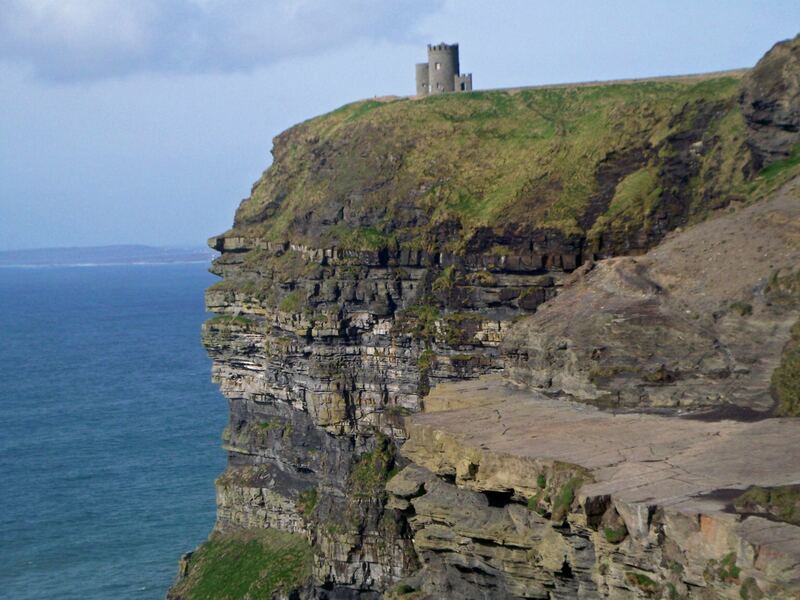 And then there was the time at the Cliffs of Moher in Ireland when Laura climbed over the safety wall to catch that “perfect” shot. And the time in Northern Ireland when I had to turn back while crossing the Carrick-a-Rede rope bridge on a windy day. And yes, even the time at the “knife edge bridge” at Victoria Falls in Africa when I couldn’t see the bottom of the gorge due to the mist. 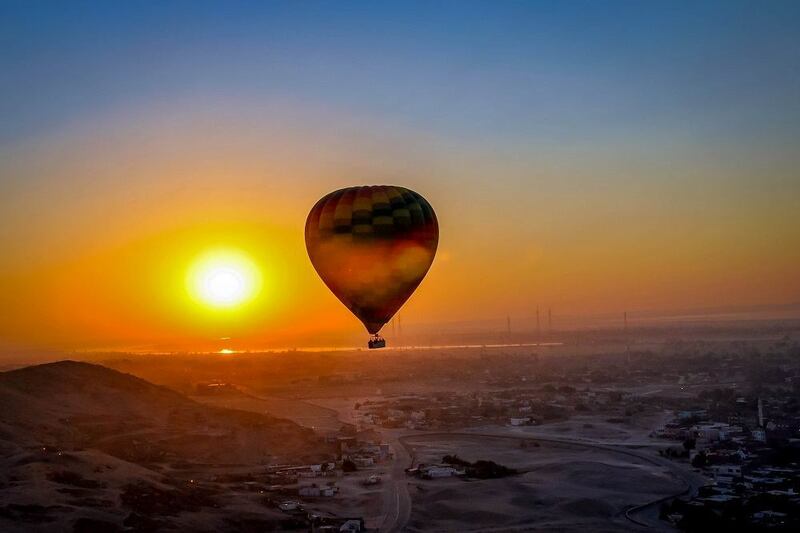 But there are other times that I expect my fear to kick in and it doesn’t: hot air ballooning over Egypt or Turkey. If you love to travel, climbing church bell towers, views from mountain cliffs, hot air balloon rides, and similar things are the price of entry for amazing experiences. And sometimes I miss out. I don’t know what causes it and can’t always predict when it’s going to happen. 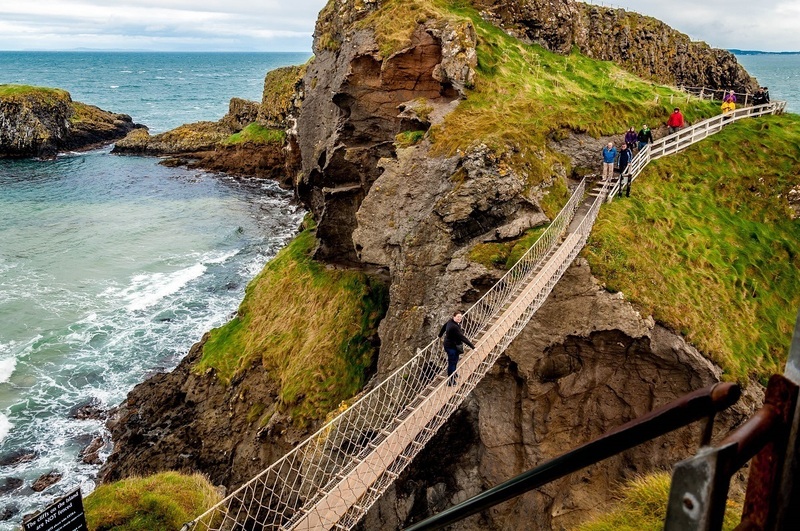 Laura crossing the Carrick-a-Rede rope bridge. I had to turn back. In our newsletter, we asked our readers to do two things. First, e-mail us and tell us about your personal fears. And two, between now and the end of the year, do something that you’re afraid of or get out of your comfort zone. We received several amazing e-mails from readers about what they fear, perhaps none more poignant than Helen who explained her ultimate travel fear: a fear of flying. It is a major impediment to being able to travel and see the world. In response to our challenge, Helen is addressing her travel fears by flying to see relatives across the country for Thanksgiving. As November rolls around, our thoughts will be with Helen as she makes this journey. As for me, I recently went out on the roof of a high-rise building in New York City. I got some beautiful views and pushed myself a little outside of my comfort zone. Being comfortable is easy, and I need to remind myself to step out on that ledge and take a little bit of a risk. Having fears makes us human. It’s what we do with them that defines us. What do you think about Confronting Our Greatest Travel Fears? Yikes, that fear is certainly understandable, but it’s amazing to know that you try pushing yourself out of your comfort zone. It certainly isn’t easy to do so. You’ve raised a good point too; fear does make us human, but it doesn’t have to win every time. Great read! Thanks so much Jac. It’s helpful to hear I’m not the only one! Thanks Cassie. Sometimes I just feel so silly about the whole thing. Laura felt like she need to hang back with me and I did things I wasn’t comfortable with for her. Now, we each do what we want. I go at my own pace and she takes the camera up ahead. We address our fears one step at a time, one foot in front of the other. What a fabulous and honest post! I myself suffer from a fear of heights but have a love of travel. I’m a snowboarder and the first time I boarded a chair lift to go to the top of the mountain I was in tears. I felt sick and dizzy being so far from the ground and when I got to the top I thought I was going to collapse. Slowly, over time i’ve started to overcome this fear. Chair lifts no long bother me, but if I find myself on a narrow trail run, even now, when I can see over the edge of a mountain I sometimes freeze in terror and have been known to take my board off and walk until I get to a wider area where I don’t need to be so close to the edge! It seems crazy given i’m happy and compitent whizzing down black runs! Like you, I keep on pushing myself but the thing is, my fear of heights is not irrational – I really could fall off the side of a mountain, so there is real validity to the fear which makes it even harder to get over but sometimes the rewards really are worth it! Thanks for sharing. I grew up in Colorado and did a lot of skiing and the chairlifts never bothered me (for some reason). I haven’t been skiing in a while, but am going again this winter, so I’ll have to see it effects me. How inspiring! I know exactly what you mean about becoming more fearful with age. It seems like the more we fly, the more afraid of it I become :-p Congrats to Helen for taking on flying head on! Climbing over walls to take pics?!?! NO WAY. I find that I get more afraid as I get older. Or maybe I should say I grow wiser? Either way, my travel fear is driving a motorbike. I used to want to drive one and then one day the thought of it scared me. I’ve tried to learn, but am just too scared to take my feet off the ground. What can we say, Laura will do anything for that perfect shot! I’d actually want to learn to ride a motorcycle. Hopefully that won’t cause me the same issues. Hey Lance! I feel like we share the same fear, which I want to describe as a fear of heights but I think more accurately it’s a fear of *falling. Like you, I have no problem being up high so long as there’s no immediate danger of plunging over an edge. Without protective barriers, however, I’ve been known to suffer from severe vertigo and panic attacks. I’ve faced this fear head-on a couple of times now, first by skydiving, but more recently by doing one of those “Tarzan swings” in Costa Rica (which, for whatever reason, was infinitely scarier than jumping out of a plane…maybe because I was so much closer to the ground?). But there are certainly things I’ve refused to do as a result of my fear (scaling Huayna Picchu, for example) so I know I haven’t truly conquered it just yet. Perhaps I never will, but maybe that’s okay? That’s an interesting perspective. I don’t know if its the heights or the falling, but I’ve noticed that the presence of wind makes it much worse. Perhaps that’s why the calmness of the early moving helps with hot air balloons. My fear is going fast – fast driving on any type of vehicle or things like skiing/snowboarding. And a car accident really didn’t help. I get such anxiety any time I am in the car now and I just can’t relax. Good advice, no one should let their fears stop them from seeing the world! I just wrote about some of my fears while traveling, they’re a little more odd ball, and out there, but I think making it funny helps 🙂 Check it out and let me know what you think.